The expression, “Marketers are data rich and insight poor” is more true today than ever. Marketers all over the world are working to optimize marketing operations and effectiveness using their abundance of data. Many are turning to tools and platforms powered by artificial intelligence and machine learning. AI promises to make sense of all the dark data companies are sitting on as well as structured and unstructured data online to surface insights about customer behaviors, opportunistic content and emotional triggers to inspire conversions. In an age of too many choices, increased competition for customer attention requires every advantage to optimize for reach, engagement and conversion. Marketers are using AI to automate and optimize their marketing because that’s what it will take to meet customer appetite for personalized experiences. In a study by Smart Insights, AI and Machine Learning were rated the #3 marketing activity that will make the largest commercial impact on business in 2018. Another study by Salesforce found that high-performing marketing teams are more than 2 times as likely to use AI in their campaigns than under-performers. What are marketers doing with AI? Areas of focus include advertising automation and optimization, chat bots for service and assisting in sales, and content personalization to name a few. Chat apps and bots are increasingly being used beyond light customer service to engage customers during the sales process. In fact, 1.82 billion people worldwide are projected to use a chat app in 2018 and by 2020, customers will manage 85% of their relationship with the enterprise without interacting with a human. Make no mistake, the artificial intelligence platform market is growing fast: it’s estimated to be worth $9.88 billion by 2022. As Josh Nite mentioned in his recent post, “This changes everything. AI is transforming digital marketing.” From A to Z and then some, here are 54 tools that leverage artificial intelligence and machine learning to make your marketing smarter, more efficient and effective. There you have it. 50 plus tools that leverage artificial intelligence for marketing. For your convenience, I’ve made a list of all Twitter accounts on this AI Marketing Tools list here, in case you want to follow the category easily. Whether you’re trying to get more out of existing marketing software like analytics or automate content generation or boost your ability to understand customer behavior for better personalization, there’s a tool or platform for you. At the same time, very few of these AI powered marketing solutions are “set it and forget it”. They still need humans for optimal performance. That’s why I like the expression “Augmented Intelligence” as a reflection of how people and technology can work together for more optimized marketing. And when it comes to marketing people, I don’t know any better than the team I get work with at TopRank Marketing. What AI powered marketing tools did I miss? Which do you use? Please share in the comments. 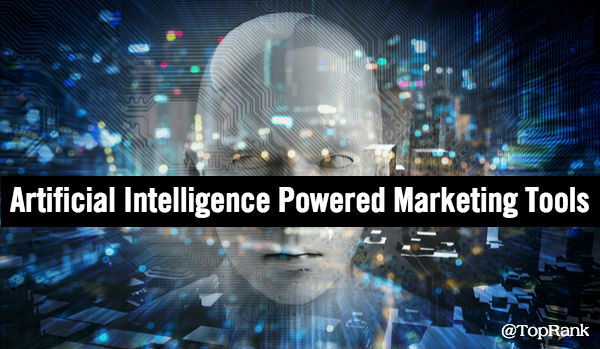 The post 54 Artificial Intelligence Powered Marketing Tools appeared first on Online Marketing Blog – TopRank®.